This chapter argues that ‘framing' the challenges posed by radicalised individuals ‘online' where the path to violent extremism is just a click away, is as much about getting the framing right as it is about getting the operational plans right. A general framework based on 4 P's (Policing-Public-Policies-Politics) is proposed as the conceptual ‘frame' for combating violent extremism. The metaphor of a compass is used to examine this 4P's framework from the perspective of knowledge management. The key notions of ‘violent extremism', ‘radicalisation' and ‘digital era' are deconstructed before presenting a neurocognitive-based model of ‘self-indoctrination' by those who ‘inspire' a violently extreme narrative through social media technologies using the ‘dark net' of cyberspace. Law enforcement's use of communication interception technologies and data retention laws is critically examined. The chapter concludes with operational implications for Policing the Public with Policy tools in the context of Political realities. The ability of a police organisation to effectively combat violent extremism and radicalisation in the ‘online’ digital era of contemporary society poses significant challenges. Like all challenges or problems how they are framed, in terms of the conceptual lens through which they are viewed, very much determines the parameters and hence the efficacy of any proposed solutions. Einstein’s famous remark that “it is the theory that determines what can be observed” is central to this endeavor to deal effectively with policing online violent extremism and radicalisation. 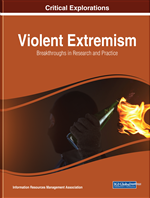 This chapter argues that the ‘framing’ of the challenges faced by police organisations with the rapid rise of potentially radicalised individuals online, acting alone or in tandem with tight or loose networks of like-minded believers, where the path to violent extremism is just a click away is as much about getting the framing right as it is about getting the operational plans right. Therefore, the chapter proposes the starting point for ‘framing the challenges’ should be a general-level conceptual framework consisting of 4 big P’s to do with Policing, Public, Policies and Politics. In the first section of the chapter, the metaphor of a compass is used to explain and examine this 4P’s framework for police organisations. While this framework provides the conceptual scaffolding, the actual perspective adopted for framing the challenges of online violent extremism is that of Knowledge Management (KM). Dean and Gottschalk (2007) have written extensively about KM as it relates to a policing and law enforcement context. Dean (2012) coined the term ‘Knowledge-Managed Policing’ (KMP) for what he sees as constituting KM from a policing perspective. KMP is a practitioner-friendly framework combining a suite of applications for capturing and managing, systematically, the growth of tacit and explicit forms of knowledge to enhance efficient and effective policing through increasing the stock of policing knowledge and its ‘knowledge value’ for the betterment of society. Initially the chapter uses this KM perspective to explore the key notions of violent extremism, radicalisation and the digital era. Each of these concepts in their own way are neither straightforward nor uncontested. Thus, definitions of each of these notions are critically examined to tease out their contentious elements so that a clear and coherent understanding of what each contested notion entails can be deduced. In this manner, some commonality of the core knowledge value of these problematic notions can be achieved in order to understand how best to ‘combat’ violent extremism and radicalisation in the current context of the digital age in which we live. This section also includes a neurocognitive-based model of the critical and central role that the process of self-indoctrination plays for individuals engaged on the road to violent extremism by those who ‘inspire’ them through online technologies. The use of communication interception technologies (CIT) and data retention laws to combat violent extremism.